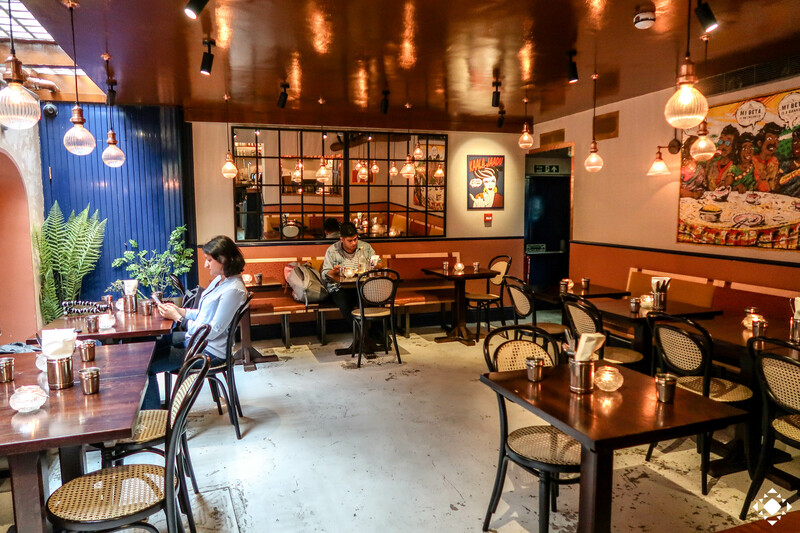 Shortly after Eid, we visited DUM Biryani House – an Indian restaurant in the heart of Soho specialising in Biryani from Le Cordon Bleu alumnus Dhruv Mittal. According to the DUM Biryani House website ‘DUM refers to the cooking method of Biryani where meat or vegetables are layered with rice and steamed together until they are both cooked to perfection’. We were greeted by the General Manager, Gopi Ketineni (ex-Trishna), who talked us through the concept and the menu. We were there around lunchtime on a Tuesday and the place was quiet though it filled up as time passed. 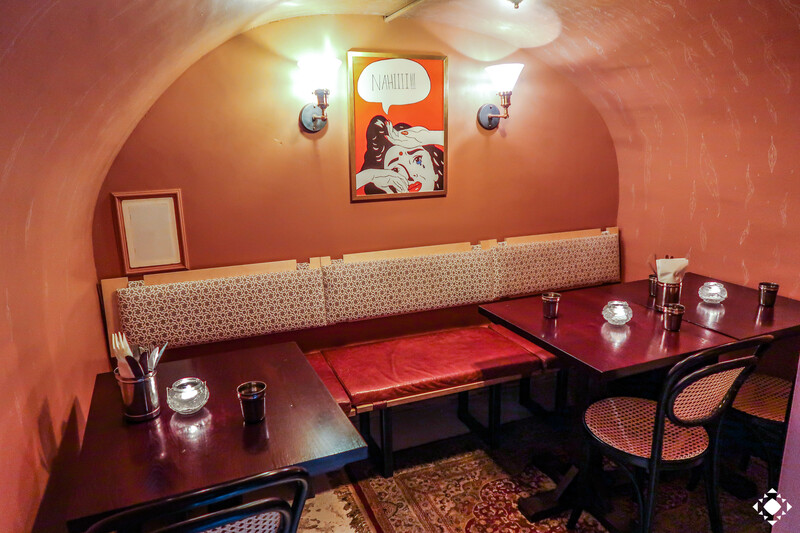 As we entered the restaurant (which is unassuming from the outdoors with a small blue door) and made our way downstairs to the restaurant one thing that immediately stood out was the decor. I was really impressed to see artwork from Desi pop artist Maria Qamar, also known as ‘Hate Copy’. Her work depicts the lives of first generation Indians living in the West and her illustrations are bound to make you laugh. The hip hop playing over the speakers in the restaurant was certainly unexpected but appreciated! DUM Biryani House has a small but sufficient menu and we started off with the Kopi Vepudu Wings and Mutton Fry, washed down with a bottle of Thums Up. Click here to view their menu. If you can handle spicy food, the hot and sour chicken wings might be for you but we found them to be a little too hot for our liking. The mutton fry consisted of lamb which had been slow cooked in Andhra Masala. Served with a paratha, this dish (not pictured) is one we’d definitely recommend given the tenderness of the lamb and flavour that had come from the masala. When eaten with the paratha, the combination of flavours and textures definitely satisfied our palates. We figured ordering a DUM Biryani from the main menu would be too heavy for a lunchtime outing and so we were happy to see that the restaurant had a biryani option on their lunch menu. 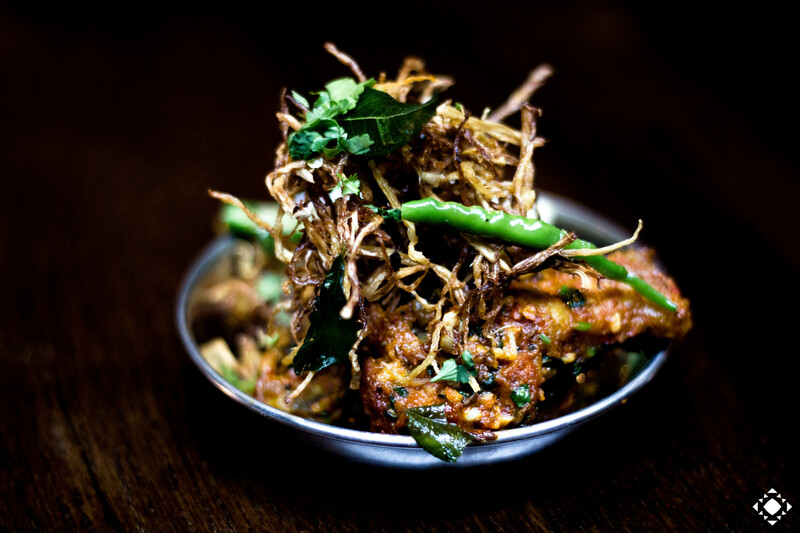 For just £5, the Kachche Murgh (Chicken) Ki Biryani is served in a thali with papads and aloo raita. 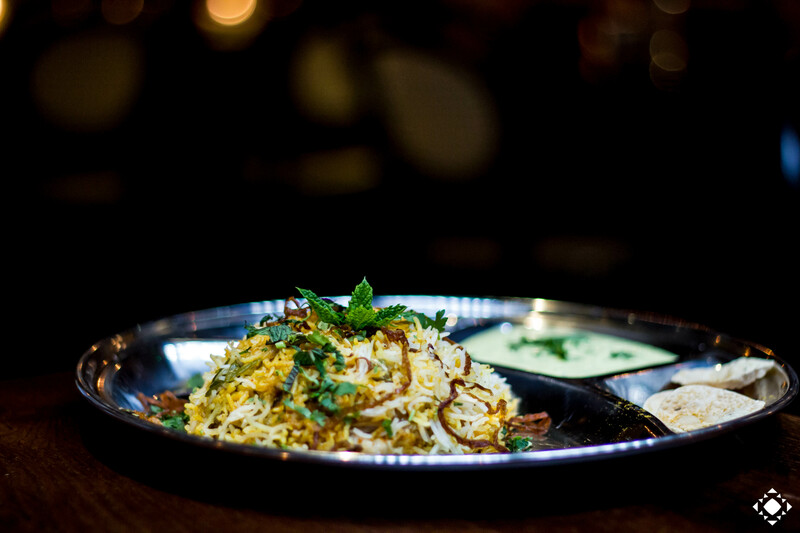 The biryani is made by layering marinated chicken and rice and then cooking it in a sealed pot for over two hours. The biryani was fragrant, the chicken was soft and the whole dish was perfectly cooked. Served from 12pm-3pm every day this thali is more than enough for one person and great value for money – one of London’s best cheap eats in our humble opinion! Whenever we go to a restaurant we try to order something from the Special of the Day menu or a dish that is generally considered unique or special to the chef at the establishment. The special at DUM Biryani House on the day was Haleem which is a stew made with wheat, barley, meat, lentils and spices. 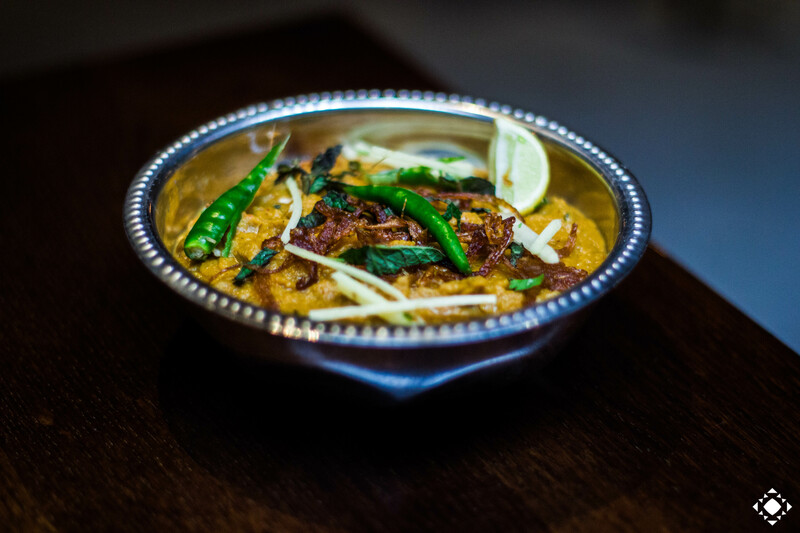 Hyderabadi Haleem is slow cooked giving it a paste like consistency. I wasn’t a huge fan of this dish mostly because I generally prefer Gujarati haleem which a lot thinner in consistency and more soup like. The Haleem had a rose water like fragrance to it (I’m not sure if that’s what it was) which I didn’t like. The General Manager Gopi asked us to try Rabdi for dessert. 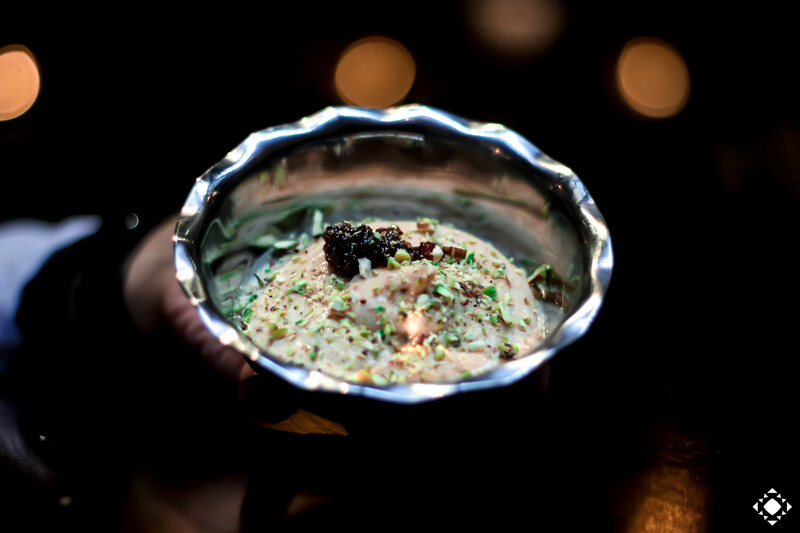 Rabdi (or Rabri) is an Indian Milk Pudding with Rosewater, Cardamom, Caramelised Rose Petals and one that I hadn’t tried before. The dessert was pinkish in colour, sweet, creamy and served chilled. The chopped pistachios on top gave it a nice texture and I would recommend this dessert if you like other Indian desserts such as Kheer or Ras Malai.